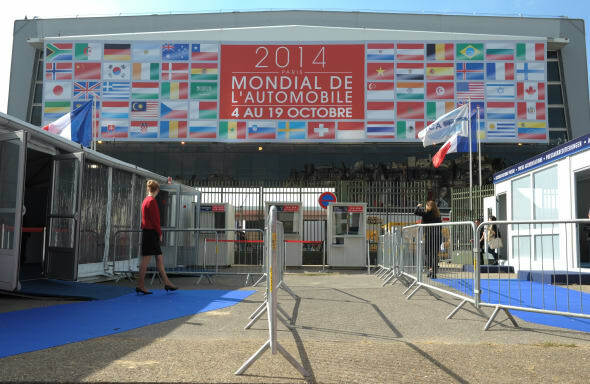 Today sees the opening of the Paris Motor Show - one of the most eagerly anticipated automotive events of the year. AOL Cars editor James Baggott is on the ground at the 'Mondial de L'Automobile', along with reporters Christofer Lloyd and Dave Brown, who will be bringing you live updates throughout the day. There's plenty we've been looking forward to, from the latest Mercedes AMG sports car to more everyday kit like the handsome new Ford S-Max. Of course, we'll be stopping to gawp at the multitude of futuristic concept cars on display, too. Stay tuned to this live blog for the latest news from Paris as it happens. And that's a wrap! Paris has been a fascinating show this year and despite my fears everyone had shot their bolt early with pre-launches of huge cars like the Discovery Sport, Mazda MX-5 and Volvo XC90, there were still some welcome surprises. 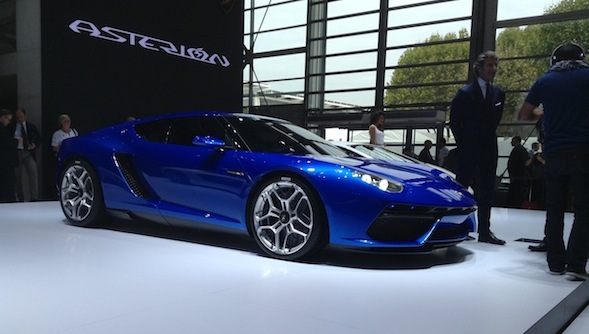 My favourites were on show in the VW Group Hall with the Lamborghini Asterion stealing the limelight. However, my real star of the show was just across the way on sister firm VW's stand in the shape of the Ducati Panigale V-twin engined XL Sport. Putting a bike engine in a car, especially a lightweight one, is nothing new with kit car builders perfecting the art for years, but when the Germans start doing it things get serious. I for one hope this gets the nod from VW's top brass. A fascinating insight into a confident automotive industry fizzing with ideas and innovation, with the French manufacturers taking centre stage in many ways. Who can blame them when this is the show that takes place in their back yard every two years? A couple of final thoughts: air conditioning in the halls for 2016 though please! And also, my favourite car of the show, which has to be the Volvo XC90. We've been waiting a long time for a new version, and we've not been left disappointed. Not only does it look fantastic, but it's got the technology and luxury appointments to take on the mighty Range Rover. It's fantastic to see Volvo on top of their game, creating truly desirable cars again. The take home thought from Paris for me is that while there are some stunning concepts on show some more mundane machinery has actually been really rather interesting. My favourite car would have to be the Skoda Fabia. Skoda have taken a worthy but unmemorable car and given it some real style inside and out without jeopardising its everyday usability. 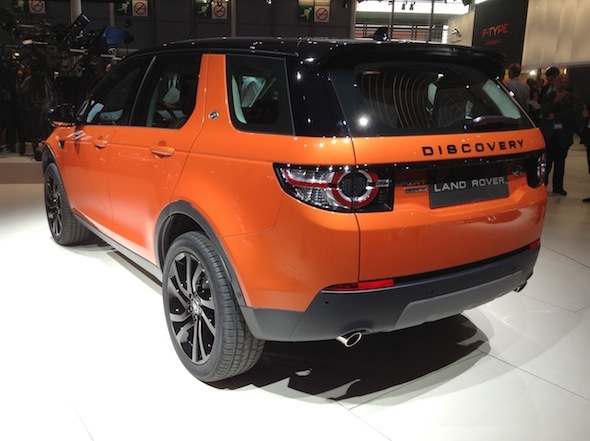 I'm not a big 4x4 fan but I can see exactly why buyers will be clamouring to get their hands on the new Land Rover Discovery Sport, too. Expect to see this car clogging up Waitrose car parks and home counties schools at home time in the very near future. I'm trying to think of I've seen a cooler car than the Lamborghini Asterion today and to be honest I'm struggling. There's nothing quite like a slice of Italian supercar to get the camera bulbs flashing and film crews crowding around, and this car has certainly done that. It's getting late in the day here now and still there's a huge throng of hacks pushing their way to the front to get a picture. The Audi TT Sportback has been designed to appeal to company car drivers, said a spokesman for the brand. The second generation TT sold 10,000 more models thanks to a Diesel engine being offered for the first time - and many of these went to fleet buyers. However, several company car lists ban coupes so Audi has developed this - a compelling proposition for those fleet user choosers. "It's still a concept at the moment but if it gets the go ahead we'll clean up," winked the Audi PR man. Off-road may be very on-trend at this year's Paris Motor Show, but we're not quite sure about this creation, the beach buggy-esque Venturi America. 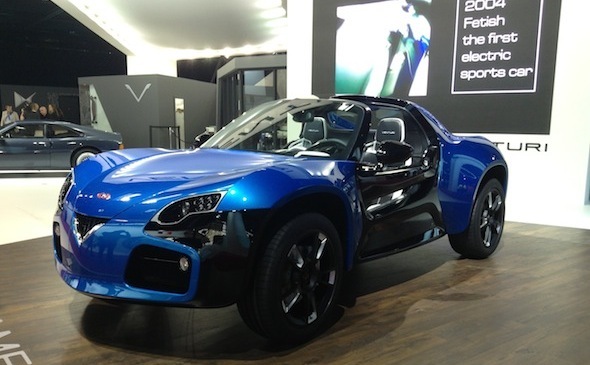 Have a look at the image of this electric semi-convertible and make up your own mind. Swoopy SUV coupes seem to be one of this year's big things. One of the swoopiest and most coupe-like is the stocky Hyundai Intrado, which looks pretty convincing it the flesh. We've been eyeing up the new Lamborghini concept, the Asterion. This curvy machine isn't as sharp edged as the current range of Lamborghinis, but it still looks pretty gorgeous to these eyes...especially with the Lancia Stratos-aping window line. 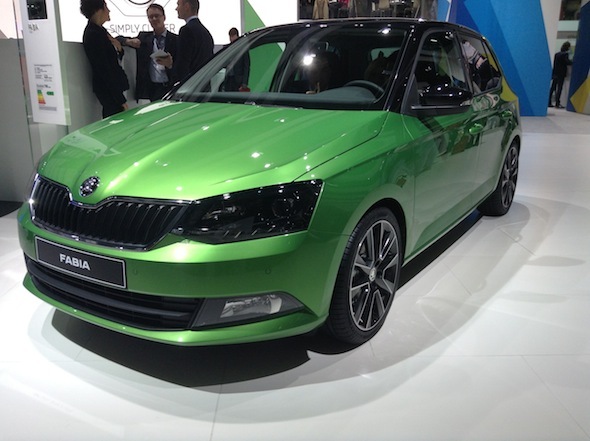 The current Skoda Fabia is a solid but unexciting small car. 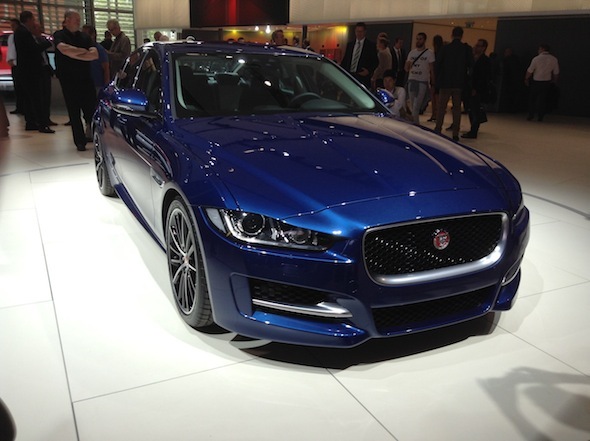 The new model looks set to change that, though, with its sharp interior lines and chic but functional interior. Skoda will also be offering many more personalisation options with the new car, taking a leaf out of Mini's book. Expect it to sell like hot cakes. Jag bosses tell us that, though the new XE is rear wheel drive, owners won't have to worry about getting marooned, should it snow, thanks to a new system called "All Surface Progress Control". Rear legroom however, is not as generous as it could be. Land Rover managers are expecting big things from the new seven-seater Discovery Sport and based upon its comfortable but practical interior, bold styling and claimed blend of on- and off-road ability, we're inclined to agree. Just finished a fascinating interview with Moray Callum, chief designer for Ford. He heads up a team of 1100 designers across the globe and has the final say on the looks of all of its cars. He tells me if he was at the top of the Ford decision making tree it'd be a Capri he'd sign off first and that he thinks the time is right for the Mustang to arrive in the UK. He added that he's very proud of the new look C-Max, especially the design of the front end. While the new S-Max is a perfect example of the global Ford strategy, he says. Just caught up with Kia's UK boss, Paul Philpott. He says the interior quality of the new Sorento marks it out from its predecessor. We're inclined to agree. 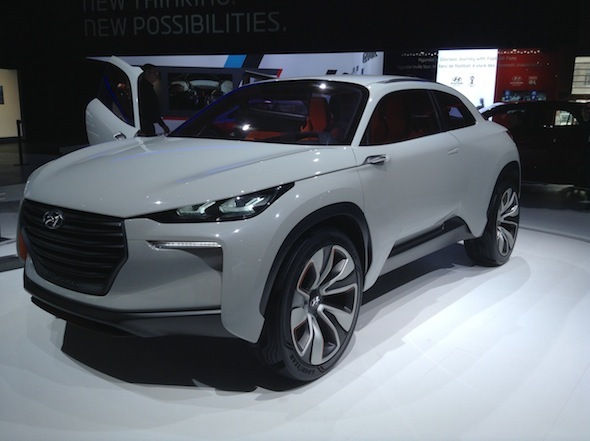 There's lots to look forward to at Hyundai according to my chat with UK president Tony Whitehorn. Most notably a hot performance range of cars badged 'N'. The manufacturer is planning a performance range of cars to rival Ford's ST and RS models but it hasn't decided how hot to go just yet. Whitehorn said: "The hot cars are coming but we have decided just how hot they need to be yet. Petrol heads would love an RS rival whereas ST rivals make sense. We're still undecided but I can tell you they will be badged N cars." The new i20 seen at the show and the new i30 will be the first cars to get the performance treatment, added Whitehorn. 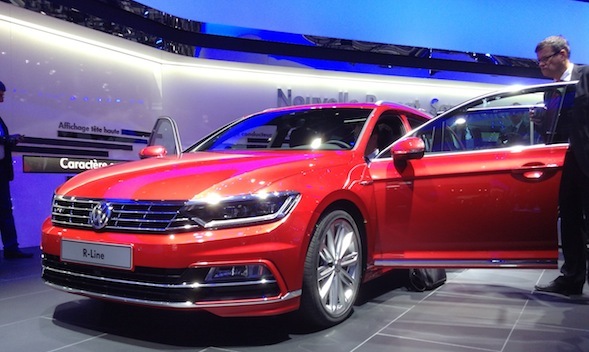 The new VW Passat is really going to grab buyers attention, UK VW boss Alex Smith told me. "It's got a much more premium feel and the proportions of the car make it seem much sleeker, much sportier. It's got a really fantastic stance on the road. Take a look at our pictures to see whether you agree. We've just heard from Skoda director Alasdair Stewart that the new Skoda Superb family saloon is going to be "radically different" to the current car. Just heard the latest from Dale Wyatt, director of sales and marketing at Suzuki (pictured below), who told us it's very much a case of out with the old and in with the new for the company. "Alto, Splash, SX4 and Grand Vitara are coming to the end of their lives," he said. But there will be new models on the way for 2015, one of which will be the "extra large small car" Celerio, an A-segment offering aimed at older buyers. The other will be a new funky Vitara aimed at 30- to 40 year old drivers keen on personalisation. Volvo didn't want to create a car park at this years Paris show, just show off what they see as the jewel in their crown, the new XC90. This car represents nothing less than a relaunch of the Swedish brand worldwide. 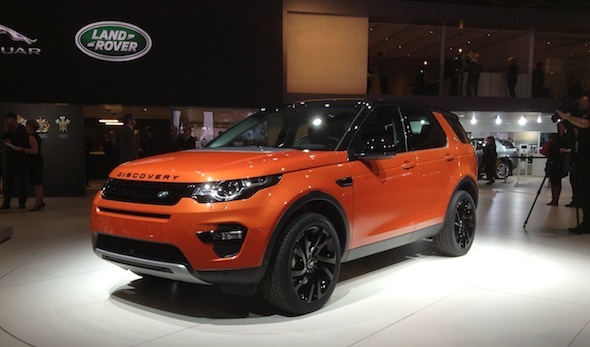 Ambitious stuff, but we'd bet the likes Land Rover and Audi are get getting a bit worried. I've just spent half an hour talking to Peugeot's new UK chief Stephane Le Guevel. He explained his priority is to improve the brand's perceptions in the UK and drag it as far up market as it can go. He says its biggest rival these days is Ford and Volkswagen and the cars being part exchanged for the new 308 prove that. He also promised that with Motorsport exploits on the world's rally stages and the Paris Dakar he will be focussing on cars that bring that excitement to the road. Next year we'll see a 2008 that has been inspired by the Dakar and he promised more GT badged cars across the range and hinted at some hot R models too. We wouldn't be surprised if we were road testing the 308 R 'concept' seen in these pictures in the not too distant future. A new limited-edition Toyota GT86 is on its way to the UK next year. The car will have a special yellow paint job and an 'aero pack' involving modified bodywork. Companies such as Cosworth have already produced tune-up packs for the affordable two-seater coupe, and much engineering data has been shared with other similar outfits, especially in Japan. 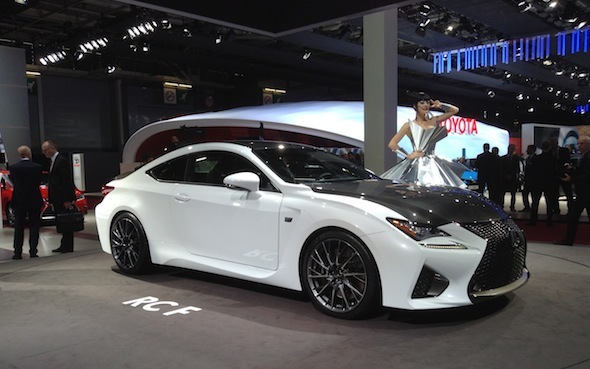 The car is fully intended by Toyota to be a base model for aftermarket tuning modifications. "It's a real watermark for Cosworth, a UK company, that they have produced a special set of tune-up packs for that car. 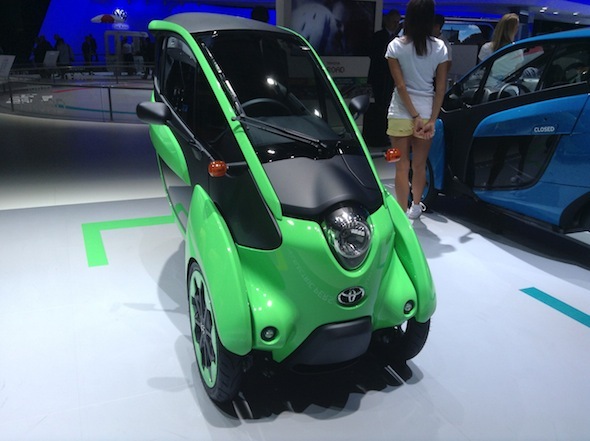 They've never done that for a Toyota before," AOL Cars was exclusively told at the Paris Motor Show today. Discussing the GT86 variants currently available to buyers in the UK, president and MD Matt Harrison added: "Volume is a little bit behind what we would have originally anticipated but that's partly because the segment in which it sits is in decline. "People buying in that sector buy across premium and mainstream as well but it's still doing a lot for the brand. That's the role for that car - It's not just about sales, it's about what it says in terms of excitement and the coverage that it generates for us." Could Toyota's i-Road concept really be the future of urban transport? It definitely looks striking, but we're yet to be convinced that this is the answer to all of our city traffic concerns. I've just had a long chat with Mitsubishi UK managing director Lance Bradley. He's promised me that there are some exciting cars in the pipeline that will have the spirit of the now defunct Evo. The firm is focussing on plug-in hybrid technology at the moment - and doing very well as a result - but he said: "There's no reason PHEV and performance can't go hand in hand. There are some exciting models to come." He also said the next generation ASX, due in 2016, will come with a PHEV variant that he thinks will be even more popular than the Outlander version that's setting sales charts alight at the moment. Lexus wants to be known for producing exciting cars as well as sensible saloons. Could this new RC sports car be the car to once and for all burst people's preconceptions about the Japanese brand? Watch this space. Land Rover's new Discovery Sport has chunky styling on the outside and a plush but practical interior. Expect to see a lot of these on UK streets in the near future. 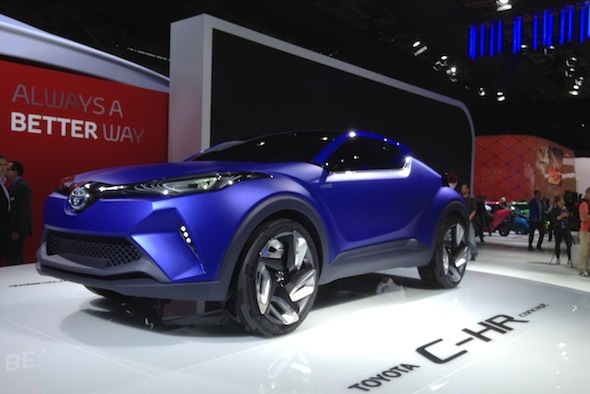 We're quite taken with Toyota's bold CH-R off-roader concept. Sadly it doesn't look like this will be arriving on our streets any time soon though. 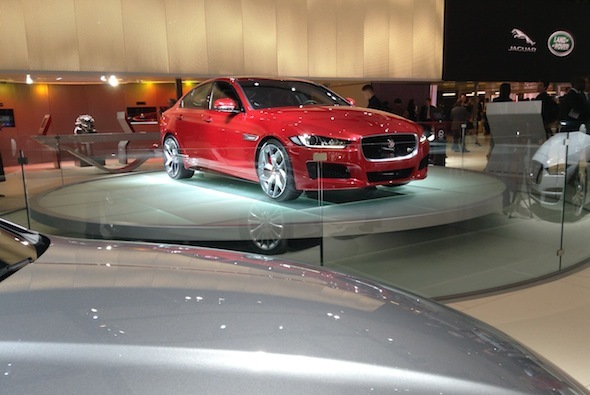 The Jaguar XE saloon looks good on paper, but even better in the flesh. Should be reasonably affordable to run too thanks to the option of a 75mpg diesel. This feels like an old car already, it's been knocking around the motor show halls so long. I'm sure this is at least the third time we've seen an iteration of the Honda Civic Type R - I wish they'd just hurry up and launch it. This latest version looks amazing though with aggressive front splitter, quad pipes and bonkers spoiler. If it has the go to match those looks we're in for a real treat when this hits the streets. Lexus is planning a complete renewal of its product range over the next five years, with a target of 100,000 sales in Europe by 2020. That's according to Alain Uyttenhoven, head of Lexus Europe. And its new crossover NX will be a game changer for the brand. Lexus has partnered with Will.i.am to promote the car as he is a 'true pioneer who loves to be creative and even a bit provocative... A perfect match for Lexus,' said Uyttenhoven. Lexus sales are already running 26 per cent up across Europe in 2014. Coming next spring is the NX 200t with a 2.0-litre turbo petrol motor. The compact off-roader market is booming. 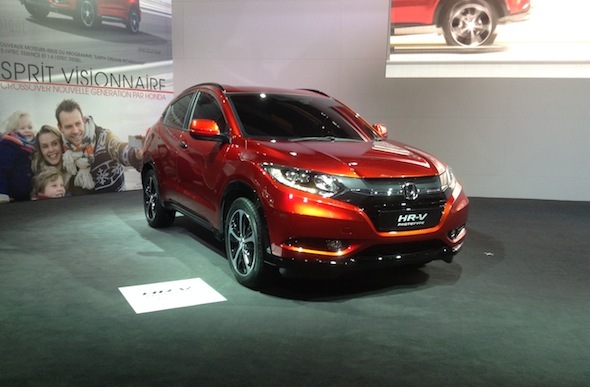 Here's Honda's latest concept HR-V, which it hopes might steal customers from the likes of the extremely popular Nissan Qashqai. Predictably, Citroen is using its domestic motor show to make a big song and dance about its clever new C4 Cactus Airflow Concept. Quite a looker, isn't it? 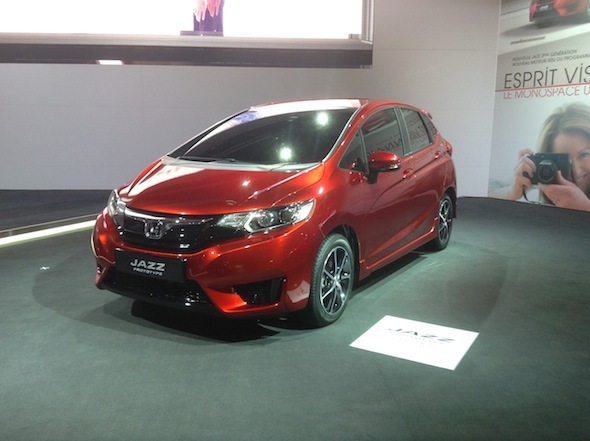 Honda has sharpened up the lines of its popular Jazz hatchback with its new concept car. I've popped to the French dominated halls where Peugeot, Citroen and Renault are desperately trying to outdo each other. This cool Peugeot 2008 DKR caught my eye. Based on the road car the competition spec monster has a 3.0-lite bi-turbo diesel, 340hp and 800Nm of torque. And it's got looks that would stop traffic on the school run. Monstrous. I'm in. After weeks of worrying that I wouldn't make it past the gates, I've managed to sneak my way into the Paris Motor Show. I stupidly forgot to apply for press accreditation this year, but needn't have worried. While a security guard was distracted I walked straight past them. So have technically broke in. Hopefully our coverage will make up for it. As way of celebration I took this picture of a giant cardboard elephant.